The green screen of life. Until the late 1980s, handheld gaming was very limited, both in processing power and the capabilities of small monitors. Gaming until then was achieved by having an LCD screen that had all possible graphical elements built into the screen, and gameplay would be achieved by controlling which elements were visible to simulate graphics, basically a video game form of Limited Animation. This had been going on successfully for years with Tiger Electronics' handheld games and Nintendo's own Game & Watch series. Then it became possible to fit an actual game system into a portable device. Atari tried to get into this with their Lynx, and Nintendo went in with the Game Boy. Gunpei Yokoi, who had designed the Game & Watch, realized the system would work best if it was small and light (to enhance portability), durable (since it would be carried around a lot), inexpensive (since portable electronic devices often went that way, save for laptops), and energy efficient. He succeeded on all counts, and the Game Boy was released on April 21, 1989. Any handheld that didn't follow the handheld's design paradigm didn't make it very far. Although brand name and a Killer App were also important, as the Neo Geo Pocket and Wonderswan proved. The system was often mocked for its four-shade greyscale screen and lack of backlight, not just by competitors but even internally within the company,note its Dox Matrix Game (DMG) codename was twisted into the nickname "DameGame", meaning hopeless or lame game, but those naysayers didn't realize those shortcomings were made up for by the aforementioned advantages. The system lasted over ten years on the market thanks to those, standing as the example (alongside a later Nintendo console) that the highest processing power is not vital to sell a system. Thanks to advances in technology, the system did have a major revision in the mid 1990s. 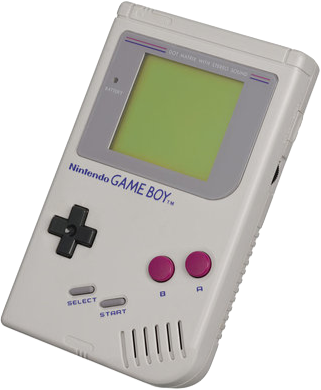 The Game Boy Pocket was about half the size of the original, and used two AAA batteries instead of four AAs. It helped boost sales for a few more years. At the very end of the system's life, Nintendo of Japan released the Game Boy Light, a version of the Game Boy Pocket which also included a back lit screen, designed by Sharp. This version was only out for about six months and only made about 12,000 units before being discontinued, and was not released elsewhere in the world. 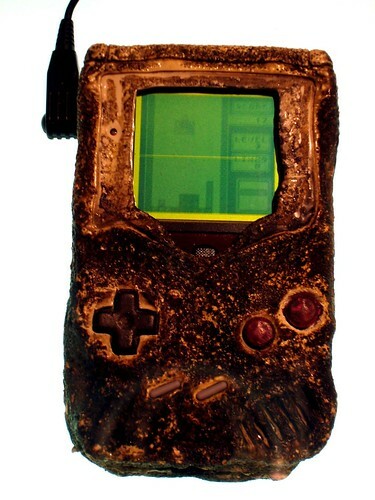 Memetic Mutation holds that the original Game Boy design is the toughest object in existence (tied with its rival the Nokia 3310 phone) after a working Game Boy was retrieved from a barracks that had been bombed during ◊ 1990-1991 Gulf War. One of the ways it saves power and cost is to integrate the data, graphics, and sound processing into the Central Processing Unit. It is a Sharp LR35902 clocked at 4.19 MHz, similar to the Z80 (a few instructions of the CPU were left out as they used more battery power than they added to processing power). The Game Boy Color adds a double speed CPU mode. 8 KB main RAM and 8 KB Video RAM. Carts could be 32 KB to 4 MB. Nintendo integrated popular features from the "MMC" support chips on NES Game Paks (scanline counters, status bars and extra RAM) into the Game Boy chipset. Game Boy Game Paks used much simpler "MBC" support chips to do bank switching and possibly battery save. This apparently contributed to the low price of the games, which were about half of NES games. Up to 40 sprites on screen at once. Size is the same as the NES (8x8 or 8x16 pixels), but it is far less likely to flicker if there are too many sprites on screen. Game Boy sprites can cover up to half a scanline (10 to a line), while NES sprites can cover only a quarter (8 to a line). Sprites can use three gray shades. Most of the time, these are set to white, light gray, and black. Four shades of grey that the original Game Boy's screen tinted to appear green. That's it. It could still have a lot of detail in the right hands. The selling point of the Super Game Boy, a peripheral for the Super Nintendo Entertainment System that allowed you to play Game Boy games on your television and in color, is to customize those four colors into a color palette of your choice or creation, saved via password. GB games created with Super Game Boy features have special palettes and borders that frequently change mid-game, and sometimes divide the screen into areas that get their own sets of four colors. There is also no light for the screen without a peripheral. One Japan-exclusive version of the Game Boy Pocket, called the Game Boy Light, had a switchable Indiglo backlight, but otherwise, Nintendo decided that the battery cost was too risky, and third-party manufacturers thrived for years trying to come up with the perfect lighting system for the Game Boy screen. The original model uses 4 AA batteries, for up to about 30 hours of gameplay. The Pocket uses 2 AAA batteries. Its battery life is only half as long as that of the original Game Boy, because of that. But with a single replacement, you still got about the same time as the original. The Light uses 2 AA batteries for about 20 hours of gameplay if the light is not turned on and about 12 hours if it is on. Boring, but Practical: The system had less processing power than its competitors for its first few years, a grayscale display in only four shades compared to the hundreds on other handhelds, and instead of a backlight it had a contrast adjustment depending on the lighting conditions. On the other hand the other handhelds with the better features turned out to be Awesome, but Impractical due to being bulky, expensive (ranging from half again more with the Game Gear, to four times with the Turbo Express), less durable battery hogs. The Game Boy instead just waited until those features could become "wilted" instead of "cutting edge", so that they'd add little to the cost and battery use, and then incrementally added them (finally adding a long-lasting system light in the Game Boy Advance SP). End result: A long-lasting family of portable gaming devices with a wide variety of games that are anything but boring. Long Runner: In any way you slice it. You could label the system's end as the release of the Game Boy Color (late 1998), the release of the final original Game Boy-intended game in North America (Pokemon: Yellow Version in late 1999), the the releases of the last backwards compatible Game Boy Color games (Dragon Warrior Monsters 2 in September 2001), or the actual discontinuation of the system in March 2003, and all would make for a wildly successful and lengthy run on top for the system. If you count the backwards compatible Game Boy Color & Advance as being enhancements of the original, than Nintendo officially supported the Game Boy from 1989 until 2010! Product Facelift: Even before the Game Boy Color was released, the original system would go through several design revisions. 1995 brought the Play It Loud! line of Game Boys, which finally gave consumers a color choice in their units (one was even clear! ), but the hardware was no different. The Game Boy Light was a Japan-only variation that tried adding a backlight (but the battery use still wasn't efficient enough). The Game Boy Pocket added a screen that was gray instead of green and had better visibility, and cut the size of the overall system down (including using slimmer AAA batteries). Tonka Tough: Game Boys are extremely durable and capable of taking considerable damage. One Game Boy, currently on display at Nintendo World in Rockefeller Center, had it's outer shell fried to a crisp in a gulf war bombing, and it was still able to play a game of Tetris! Unfortunately, this doesn't apply to the actual screen, which is very easy to scuff up and scratch, which can leave distracting shadows and glares on it in daylight.